Thomas Owen Lowe was born February 11, 1838, in Batavia, Clermont County, Ohio, the eldest son of John W. Lowe and Manorah Fishback. Beginning in 1851, Tom attended Farmers College, until his father’s financial situation forced his withdrawal from the school in 1854. For a short time thereafter, Tom worked briefly as a bank clerk at Ellis & Sturges bank in Cincinnati. Then, in 1855, he accompanied his father to Dayton. In the summer of 1855, Tom abruptly moved to Nashville, Tennessee, where he worked as a bank clerk at the W. B. Shepherd bank. He eventually took a clerk position at a different bank, the Bank of Middle Tennessee in nearby Lebanon, where he remained until the summer of 1857. Tom and Martha would live at 105 Main until sometime shortly before 1871, when they moved to 29 W. Fourth Street, where they lived until about 1877. From about 1877 to about 1880, they lived at 326 W. First Street. From about 1880 to about 1883, they lived at “Old No. 5 Main” (225 N. Main), and from about 1883 to 1885, they lived at 316 W. Monument Avenue. Nora Lowe (born March 1869; died January 20, 1958), who married Ralph Rappe McKee and lived in New York. Although he worked in banks until the age of 34, Tom was long a student of law, first studying under his father John Lowe. He roomed with a law student while living in Lebanon, Tennessee, and he continued his law studies upon returning to Dayton. Thomas Lowe was admitted to the bar in February 1859 but continued in the banking business until May 1862, when he began his law practice. During the Civil War, Tom disagreed with the war on several grounds, for which reason he was considered a “Copperhead,” or “Peace Democrat.” Fellow Daytonian Clement Vallandingham was the best known Copperhead. 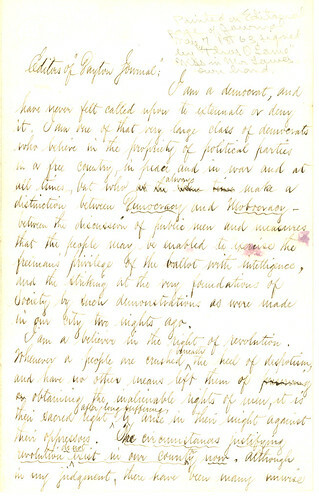 After Vallandingham’s arrest in May 1863, Tom decided that it might be prudent to spend the summer in Europe, lest he meet the same fate, since his views were also widely known. Tom returned to Dayton in the fall of 1863. On January 1, 1864, Tom was appointed to fill a vacancy as Montgomery County Auditor; he remained in this post until March 1865, at which time he returned to his law practice. He continued to practice law until he was elected Judge of the Superior Court of Montgomery County in October 1870. When his term expired in July 1876, he again resumed his law practice at the northeast corner of Third and Jefferson. Tom was a member of the Presbyterian Church from his early life onward. In the early 1870s, he became increasingly active in religious activities, especially in the YMCA. In April 1884, Tom became a licensed minister of the Presbyterian Church, and at that time he seems to have given up his law practice and was solely a clergyman thenceforth. The 1884-1885 city directory is the first entry to list Thomas O. Lowe as “Rev.” and without any other occupation. Tom is not listed in the 1884-1885 Dayton city directory or thereafter, so it may have been about that time that he and Martha moved to Richmond County, New York, where their daughter Nora Lowe McKee lived. 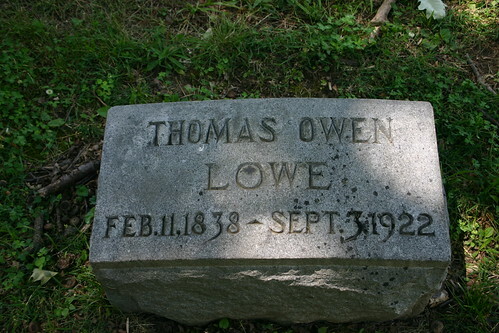 Thomas O. Lowe died September 2, 1922, at Staten Island, New York. 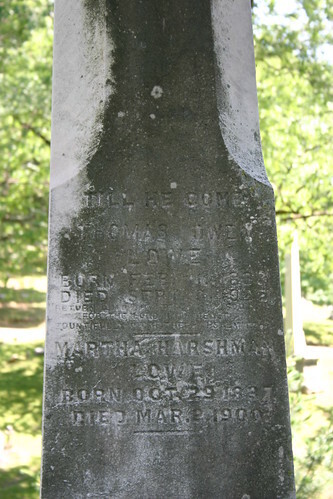 His wife Martha Harshman had died March 2, 1900, at New Brighton, New York. 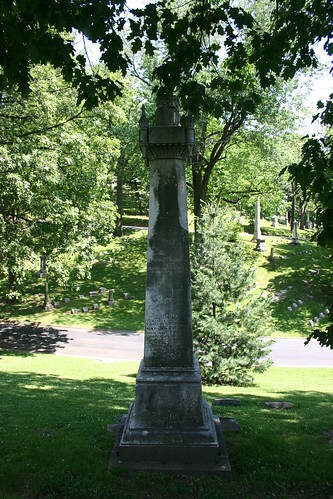 Thomas and Martha Lowe are buried in Woodland Cemetery in Dayton, Ohio. This biographical sketch was originally written by Lisa P. Rickey in July 2011 for the Lowe Collection (MS-009) finding aid at the Dayton Metro Library, 215 E. Third St., Dayton, Ohio, 45402; phone (937) 496-8654. Additional information about the sketch’s subject can be found in that collection and in the citations below. Please contact the library or this blog’s author for more information about how to access the original finding aid or the manuscript collection. I have written a few additional blog posts about Thomas O. Lowe, including: “Tom Lowe considers Civil War Service” (13 May 2011) and “Tom Lowe on Becoming a Father” (17 May 2011). Becker, Carl M. “John William Lowe: Failure in Inner-Direction.” Ohio History 73, no. 2 (1964): 75-89. “Lowe Papers.” LHR File. Local History Room, Dayton Metro Library. “Lowe, Thomas Owen.” LHR File. Local History Room, Dayton Metro Library. Obituary of Thomas O. Lowe. Dayton Journal, September 10, 1922. John W. Lowe was born in 1809 in New Brunswick, New Jersey, a son of James Baronhuysen Lowe and Catherine Kennon. John’s mother died about 1813, and his father died in 1821 in New York. At that point, 12-year-old John became the primary breadwinner for his stepmother and siblings. His childhood was marked by trauma and hardship. Around 1833, John left New York and settled in Batavia, Clermont County, Ohio, which is near Cincinnati. His early employment efforts centered around painting, but by 1835 he was studying law under Thomas Hamer, a U.S. Congressman and lawyer at Georgetown, a village about 24 miles from Batavia. John W. Lowe was admitted to the bar in 1836. Catharine K. Lowe (born 1850), who married William Stitt and later died of consumption on October 20, 1872. Despite his connection to the influential lawyer Owen Fishback, John’s law practice was not particularly profitable. 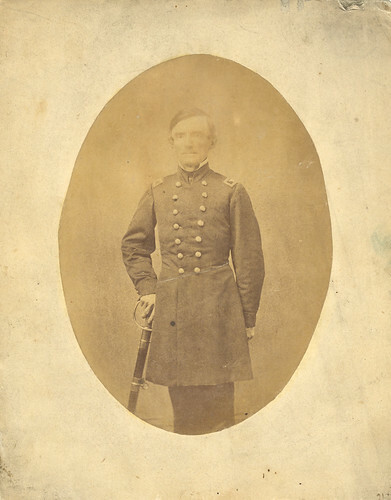 His connection to Thomas Hamer, however, had afforded him an opportunity to befriend the family of Jesse Grant of Georgetown, for whose son Ulysses Grant was recommended for West Point by Hamer. During the Mexican War, young Ulysses Grant wrote a letter to John, suggesting that Lowe seek a military command to serve in Mexico with the volunteers. A number of factors contributed to Lowe’s decision to follow Grant’s suggestion, and in September 1847, he joined the Second Ohio Infantry Regiment as a captain and headed off to Mexico. His service in Mexico was fairly average, bringing him no glory. While there, he kept a diary and wrote many letters to his family. John returned to his law practice in Batavia after the Mexican War, and in 1853 he was even mayor of the town. However, he still was not doing well in his law practice, so in 1854 or 1855, he and son Tom moved to Dayton, Montgomery County, Ohio, hoping for better prospects. In July 1855, Tom took a job in Tennessee, and shortly thereafter John Lowe moved his law practice to Xenia, in nearby Greene County, Ohio. Even in Xenia, his law practice did not do well, and he relied on Tom’s contributions to help support the family. In July 1861, the Twelfth Ohio participated in a skirmish at Scarey Creek, (West) Virginia. Afterwards, John was publicly accused of cowardice during the battle, by means of reports written by anonymous individuals and published in several in Ohio newspapers. It is unclear whether the accusations were true, since there are no references to any dishonorable actions by Lowe in his superiors’ reports. Nevertheless, John’s reputation was irreparably damaged. A few months later, on September 10, 1861, John W. Lowe was killed while leading a charge at the battle of Carnifex Ferry, (West) Virginia. He received a shot directly to the forehead and was the first Ohio field officer to be killed during the Civil War. Thomas Lowe believed that his father had acted rashly in an attempt to quiet the accusations of cowardice, thus exposing himself to an excessive amount of danger and consequently resulting in his death. It has been suggested that this incident contributed to Thomas Lowe’s negative feelings about the Civil War. However, this incident alone does not constitute the cause, as Tom had already expressed feelings of that nature. John’s wife Manorah died September 22, 1889. They are buried in Woodland Cemetery, in Xenia, Ohio. As you may have deduced from my last few posts, I am currently processing a collection of manuscripts from the Lowe Family, mainly the papers of Dayton lawyer and Civil War-time “Peace Democrat” [*cough*Copperhead*cough*] Thomas O. Lowe, as well as his father John W. Lowe of Xenia, and of course miscellaneous (an archivist’s favorite word) items from various other family members. While the significance of the collection lies in its ties to the Mexican War, Civil War, and the Copperheads, there is plenty of other interesting reading having nothing really to do with any of that. Born, on Thursday, Oct. 7th, 1858 at 11 o’clock a.m. a daughter to Martha and Thomas O. Lowe. It is a sweet little babe, weighting about 9 ¼ lbs., dark eyes and hair. The old nurse Mrs. George pronounces it a “beautiful baby” and its grandmothers Harshman and Lowe delight to point out its peculiar points of beauty. Its finely shaped head, nose and mouth all are duly noticed and pointed out to its admiring by [verdant?] parents. We receive all they say as gospel truth and already find ourselves thinking of the pleasure which we will derive from the nurture of a little being so highly favored by matrons. The advent of the little stranger was at the time rather unexpected. It was here upon us before we knew it. Immediately after the it had come choking, struggling and squalling into the world, I telegraphed Father atXenia and by 4 o’clk P.M. he and mother were here to greet it with their blessing. Henry Stoddard was the next person to whom I communicated the interesting information. He was a little incredulous at first but finally believed me and started off on a run to tell John Winters and More at the Bank. After he had told them he continued his travels telling I suppose every one he met. Shortly afterwards I went into the Court House where Judge Haynes was naturalizing a great many Irish and Dutch and upon old man Stoddard’s suggesting that I had a daughter the Judge declared the [illegible] to a [vote?] and ordered the Clerk to issue me the proper papers! It is a very queer thing indeed to feel that I am a Father—especially as mother tells me how short the time seems since she held me just such a little one as this in her arms and reminds me that before I have spent what I think to be one half my life I may be a grandfather. My great grandfather felt doubtless just as I do when his first born was placed in his arms and my grandchild will feel probably the same emotions when he first becomes a parent. Thus it goes. Human nature is ever the same and all parents in all ages have felt and will feel the same emotions at the interesting moment of which I write. I have no desire to analyse [sic] critically my feelings just now. The subject is as old as the earth and originality or even peculiarity of thought upon it is almost impossible. I love the little one already – I feel anxiety for its future – I appreciate the fact that it is an immortal being, “fresh from the hand of God” and feel a hope that it may grow up to be a blessing to us and to all who may come within its influence—and that it may finally be adopted into the family of the Children of God. These are the wishes of every parents’ heart—the subject contains nothing more. No. 105 Main St.DaytonO. Oct. 9th, 1858. I just thought this entry was really interesting and worth sharing. Now, I’m not a parent myself, but I imagine that Mr. Lowe is probably right in his assessment that of how all first-time parents have felt throughout the ages! I also think it’s interesting that he does not refer to the baby by name or even as “her”. He repeatedly refers to his daughter as “it”. I expect that is because in “the olden days” the infant mortality rate was much higher than it is now, and people tried to avoid getting attached to their babies (or even name them) right off the bat. That could explain the note of surprise in his “voice” as he writes “I love the little one already” – something I think many of us today would find an odd statement for the father of a 2-day-old baby. After Abbie, three more children were born to Thomas and Martha (Harshman) Lowe: John (1861-1917), Jeannetta (1863-1869), and Nora (1869-1958). The material discussed here can be found in the Lowe Collection (MS-009), which is publicly available for research at the Dayton Metro Library, Main Library, Local History Room, 215 E. Third St., Dayton, OH 45402. For more information on the collection, contact the library, or feel free to leave a comment on this blog. The name Thomas O. Lowe might not mean a whole lot to most people. I admit that, until a few weeks ago, I was among them. But I’ve learned a lot about the man since beginning to process the Lowe manuscript collection (MS-009) at the Dayton Metro Library. If I told you he is often lumped in with Clement Vallandingham, does that help you? If not, then allow me to explain a little bit about him briefly. 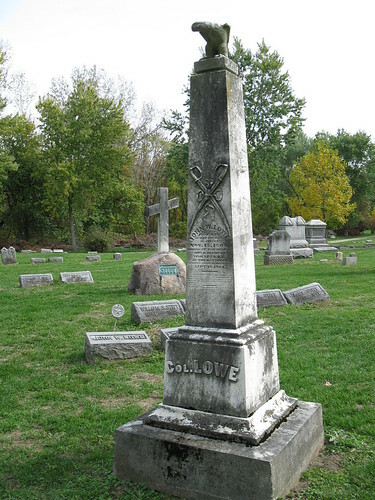 Thomas O. Lowe was a young bank cashier and later lawyer in Dayton at the time of the Civil War. He was also one of the “peace Democrats,” better known as Copperheads. According to research done by Carl M. Becker (see The Genesis of a Copperhead and A Lesser Angel) using the Dayton Metro Library’s Lowe manuscripts, Tom Lowe’s Copperhead sentiments may have blossomed during time he spent working in Tennessee in the late 1850s, as well as the senseless death of his father John W. Lowe early in the war. Now, I know that everyone has shades of gray and can go through ups and downs in forming their opinions or convictions. But still, imagine my surprise when I came across a letter in which Tom Lowe indicated that he was considering Civil War service. The prospect of a draft gave a wonderful impetus to volunteering in this section. Col. Anderson’s regiment is full and they are seriously discussing the idea of raising another. I expect to put in my application to the Military Committee tomorrow for an appointment as Major or Quartermaster of the new Regiment if they decide to raise it. I don’t want to be drafted and I want a horse to ride. If I can’t get a position of this kind I will wait until I am compelled to go and then hire a substitute if I can. I still think this war can never restore the Union but I am very much afraid Jeff Davis will be inWashington dictating a disgraceful peace to us soon, if we don’t [bestir?] ourselves, and therefore at present I am a war man. I laughed out loud when I read the part about wanting a position that entitles him to ride a horse. I suppose I can’t blame him there! If he can’t get a horse-riding position, he’s not going! I don’t mean to make fun; but still, this whole section struck me as funny…both in what he said (the fact that he was even considering joining up), as well as the way he said it (the underlines exist in the original letter, as emphasis). According to a letter from Thomas O. Lowe to Adjutant General Charles W. Hill on July 12, 1862 (a few weeks earlier) [Ohio Historical Society, Series 147-38: 142], Lowe had already secured a substitute. I wonder whether this was in fact true, because from the sound of what he told his brother, he hadn’t obtained one yet. And what was the need unless he was actually drafted? Perhaps he was just planning ahead. In the end, Tom Lowe did not serve in the Civil War. He was not even in the country for part of it. After Vallandingham was arrested in May 1863, Tom Lowe headed to Europe for the summer, out of fear that he might be next. (He didn’t limit his opinions to private family correspondence; he had written many letters to the local newspapers, as well, so his views were well-publicized!) Unlike the dramatics attached to Vallandingham, Lowe was able to return to Dayton and led a relatively ordinary life, especially after the war ended. He continued his career as a lawyer and eventually a judge; in his later life he became a clergyman. The Lowe Collection (MS-009) is publicly available for research at the Dayton Metro Library, Main Library, Local History Room, 215 E. Third St., Dayton, OH 45402. For more information on the collection, contact the library, or feel free to leave a comment on this blog.